My name is Mutsurou Ishii. I am a Japanese and I would like to tell you about CDT(Chlorine Dioxide Therapy), which might be very effective against Ebola. Today people don’t have any effective medicine or treatment against the epidemic Ebola and it is spreading quickly now in Africa. They say the percentage of mortality from Zaire Ebola is 90 % and making matters worse, nurses and doctors too are dying. Quick actions are needed. So I think it is worth trying CDT which worked well on Dengue fever. Dengue Fever also doesn’t have any particular medicine to cure and is also caused by virus as you know. CDT is chlorine dioxide therapy. It is much better to try CDT than doing nothing. CDT is the acronym of Chlorine Dioxide Therapy. You don’t need to doubt the safety of it because over 1 million people all over the world have been using CDT for 10 years. At medical schools, people learn the chlorine dioxide as a powerful sterilizer or a germicide. You know how powerful it is by looking at the anthrax attacks in the US in 2001. At that time chlorine dioxide was appointed to be the sterilizer. It is able to pasteurize any kinds of germs or viruses. Among medical field, it is just accepted the fact that people cannot take in chlorine dioxide. 10 years ago, however, by accident it worked very well to cure Dengue Fever and Malaria and others by oral administration. After that it has been studied carefully and now we know that even children can take it. You can get further information from the URL below. Chlorine Dioxide has the high possibility to cure the Ebola patients and prevent people from contracting the disease. And so CDT will contribute to stop the expansion of Ebola contagion. I ask you all that you spread this good news to your friends. Especially to medical organization, governmental organization and other groups who carry out anything to make the world better. CDS (Chlorine Dioxide Solution) is very easy to produce. If you do not take too much of it, CDS is very safe and harmless. Please tell this to more and more people. Ingredients are easy to get. I can prepare all of them. The Red Cross also treated Malaria patients with CDT (Chlorine Dioxide Therapy). Please check the short video below. You will see little children are taking chlorine dioxide. In India unconscious serious Malaria patient experienced CDT, and after 30 minutes he recovered and started to speak to his family. This video was recorded by me (Muturou Ishii). The below is how to make CDT and how to take CDT. This site describes each stage along with the photos. CDT (Chlorine Dioxide Therapy) does not cost so much. I can say it is cheap. One treatment cost one less than cent. You can check my passport. If you click on the photo, the image will be bigger. I hope I can come to help you. Please let me have the visa. I will buy my own air ticket, so please prepare the place for the lecture meetings and the place for me to stay. I can read easy English, using translation soft but if I reply to you by myself it may be poor English. So I will ask my friend to reply to you when I mail you with a long message. 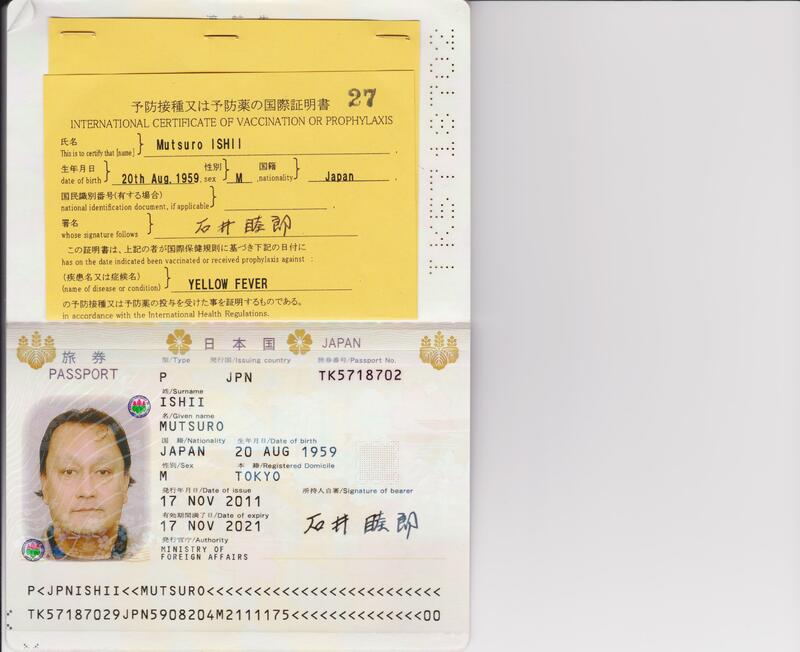 I ask you to prepare my air plane ticket and make it easy for me to get visa. I cannot understand the local language and so I need a person who understands Japanese language. And to me please send me mails or telephone call in Japanese language. It will take some time to responses in English because I have to ask my friend to translate my message. I will do my best. My number is +81 90 9853 3063. This is handy phone so you may catch me at 90-9853-3063. I do not need any reward. I just strongly desire that Ebola epidemic comes to an end.